This standard roof rack for LR3 and LR4 includes a handy front basket and notch in the rear of the rack to accommodate the shark fin antenna. This racks allows for full use of the sunroof. What's more, it only adds a total of 7 1/2" to the height of your vehicle. To install this rack, use the two hidden factory mount points on the front of the vehicle roof as well as the mounting points on the factory roof rails in the back. This 1-piece rack is made from cold-rolled, nickel steel tubing with zinc primer epoxy undercoating and durable black powder coat. All mounting brackets, stainless steel hardware and aluminum wind deflectors are included. Minimal drilling is required. 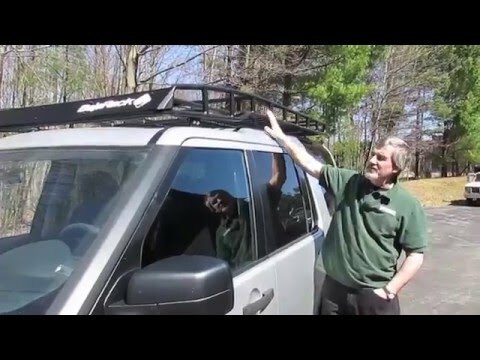 Atlantic British Ltd. Repair & Maintenance Academy How-To Video: Watch Doug, our Land Rover Master Technician, install a BajaRack BAJALR34 for vehicles with Factory Roof Rails demonstrated on a 2005-2009 Land Rover LR3. This BajaRack has side-rails. BajaRack roof racks were created as rugged storage solutions for the adventurer that likes to go beyond the trail. Please refer any questions or comments to 1-800-533-2210, or go to live chat.